The statement below was issued by March Forward!, an organization of anti-war veterans and active-duty service members. Please circulate it among friends, family and co-workers via email and social networks. March Forward! is an affiliate organization of the ANSWER Coalition. We urge you to make a donation to March Forward! "In a war directed against an entire population that overwhelmingly opposes the foreign occupation, where every Afghan is considered 'fair game,' grotesque conduct as revealed in the most recent photos is inevitable." Again, people are shocked by what is a normal, everyday occurrence in the Afghanistan war. Again, Pentagon officials act surprised and appalled, condemning an act as “isolated” and “out-of-character,” when they are responsible for creating the conditions for such acts and know full well these are part and parcel of the brutal war they are waging. Again, the focus of the discourse is on what is done with the bodies of the dead—a crime against humanity—but not at all on why there is such carnage in Afghanistan—also a crime against humanity. Nobody is asking why countless Afghans have decided to sacrifice their own lives to expel the U.S. occupation. The photos themselves do a lot to help answer that question. In a war directed against an entire population that overwhelmingly opposes the foreign occupation, where every Afghan is considered “fair game,” grotesque conduct as revealed in the most recent photos is inevitable. No condemnation from Pentagon officials will put an end to it. No token punishment of rank-and-file soldiers will prevent further crimes from taking place. No public relations campaign by the White House will change the reality on the ground in Afghanistan. There is no “good conduct” in a colonial-type war. There is no such thing as a “kinder, gentler” occupation by the most destructive military machine on the planet, attempting to subjugate an impoverished population that stands in strong, determined opposition to foreign troops on their soil. This is the reality of the war, and will be until all U.S. forces have left. The Los Angeles Times, which first published the photos, is coming under fire from the Pentagon. Pentagon officials contacted the LA Times prior to the photos being released to pressure them into not releasing them. The Pentagon asserted that the release of the photos would “incite violence and perhaps cause needless casualties.” This absurd doublespeak attempts to deflect the fact that the incitement of violence in Afghanistan, and constant needless casualties, are a result of their continued violent occupation of the country—not a few photos that simply reveal daily life in Afghanistan under occupation. The Afghan people do not need to be incited to oppose U.S. forces by a few photos. They witness it and live it firsthand every single day, and have been for over a decade. That is why the resistance has grown exponentially as the occupation continues. The Pentagon is angry about the release of the photos not because they care about “needless loss of life.” They’ve been sending thousands of American soldiers and Afghan civilians to their graves needlessly for 10 years. They are angry because they want to control the narrative of the war; they want to decide what the U.S. public sees and thinks about the war; they want to paint a pretty picture to maintain the public complacency that allows them to continue conducting the bloodbath in Afghanistan with impunity. 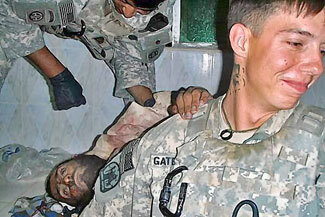 The Pentagon is angry about the release of the photos because it shows the true face and true reality of the war. And they don’t want anyone to know the truth. If they told the truth about why we are being made to endlessly kill and die in Afghanistan, and what the reality of life is like for the Afghan people, they would be exposed as the biggest terrorists on the planet, causing unmatched suffering for the private profits of the 1%. The people of the United States deserve to know the truth about the war. They deserve to know what a shocking $2 billion a week of their tax dollars is being used to fund. They deserve to know why their social services are being slashed, why their education system is crumbling, why there is “not enough money” to create jobs. They deserve to know what their loved ones are being sent to see and do. The release of the photos is an essential service to all of us who suffer from the war and who foot the bill. The people of the United States, like the people of Afghanistan, by all polls, already overwhelmingly oppose the war. But that opposition has not yet materialized into a mass grassroots people’s movement fighting to end it. This is the Pentagon’s biggest fear, because it challenges their attempt to carry out the war endlessly against the will of the people. Exposure of the truth, as seen in these photos, can act as a catalyst for resistance. There is no more important time than now to light that spark. Veterans and active-duty troops in March Forward! have been fighting to expose the reality of the war, mobilize others against it, and reach out to other active-duty troops with the message that they have the absolute right to refuse to take part in the war. We welcome the glimpses of truth that have surfaced, and call on all people of conscience to join us in fighting to end this decade-long atrocity.